Trigger warning: This blog discusses pre-term and neonatal loss and the experience many families face when losing a child. If you are feeling vulnerable at this time, we wish to not cause you any distress during a time when you are regaining strength. Losing a child, whether during pregnancy, elective termination, stillbirth, after a NICU stay or at any other point in life, is without a doubt, one of the hardest things a parent will experience. No words could adequately capture the despairing circumstances one would face, that’s often worsened by societal conditioning that these traumas should be kept quiet and not discussed. In surrogacy, this pain is magnified, as the surrogate, Intended Parent’s (IP’s) and their families are all invested and affected by such a devastating outcome. Pregnancy loss and stillbirth can be such an individual and varying experience; everyone grieves in different ways. As you navigate this new life event, there are ways that you can best support yourself and your loved ones, as you both struggle to reconcile your new reality. It’s Okay to Talk About Your Pregnancy or Infant Loss. Sometimes societal or familial implications mean that you feel shame or are discouraged from expressing yourself during this time. Normalizing an event that happens to many different people, from many walks of life, is a courageous step along the path to healing. It’s okay to imagine what your child may have been like. It’s okay to talk about the dreams you had and the depth of your loss, it’s okay to speak of them to others; the child and your loss are now a part of your identity, of who you are, and you should be seen. So don’t hesitate to open up and talk to someone you trust about whatever you feel like sharing when you feel you want to share. Don’t Judge Yourself for Feeling the Way You Do About Your Pregnancy or Infant Loss. During the grieving process, it is normal to experience a vast spectrum of emotions. Everything from fear, pain, anger, sadness, rage, hopelessness and despair, to happiness, contentment, hope, fondness, love, and acceptance. There is no “right” way to grieve for the loss of your child and feeling any of these emotions (or others) is a perfectly normal reaction to such a traumatic event in your life. What is important to remember during this difficult journey, is that you should not judge yourself for how you feel. What may make you sad and angry one day, may bring you hope and peace the next. The ebb and flow of emotions is normal and to be expected, so be gentle with yourself and your loved ones as you process these feelings. Create a Memory Box or Ritual to Honor Your Loss. 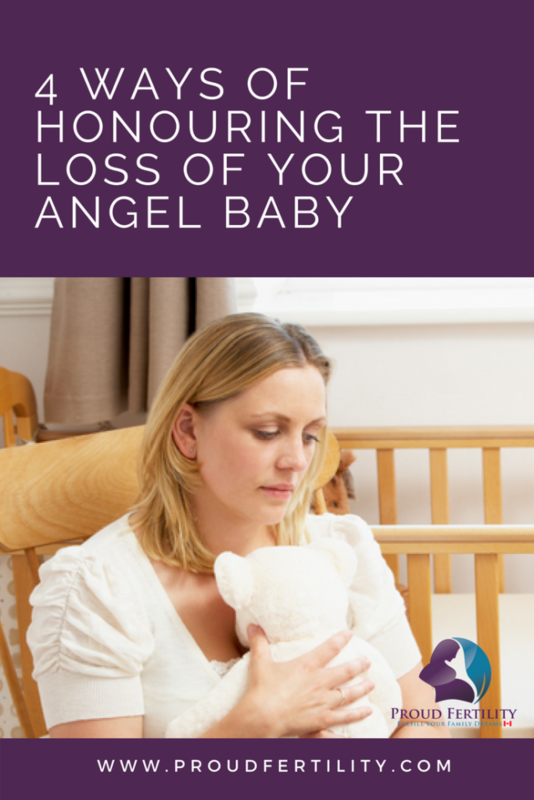 A memory box or ritual is one way to memorialize or honour your angel baby loss. A box is a useful tool to collect and keep safe, mementoes or items from your pregnancy journey. Examples of items you may want to include could be clothing items purchased, photos taken, gifts given, a letter written to your child, hand/feet prints, ultrasound scans, or any other item you choose. A memory box will be as individual and personal as the person creating it. Nathan Chan, Proud Fertility’s managing director, unpacks his own angel baby memory box as he and Randi Van Wiltenburg, a pregnancy and infant loss doula in Calgary, AB, discuss honouring your loss. Another consideration might be a ritual, as a form of honouring your baby. This could take the form of a ceremony, artwork, prayer, lighting a candle, creating an altar, writing a letter/song, or planting a tree/garden. Any of these choices, or some other form of ritual you decide upon, are simple but important ways to honour your child, your loss and helpful steps along the path of grief and healing. Reach Out to Others for Support as You Grieve the Loss of Your Baby or Pregnancy. Sometimes, we don’t want to talk. We want to be alone with our sadness and pain. We want to process internally before ever sharing externally, if at all. That’s okay too. Just know and understand that there are resources available to you during this period. Isolation can worsen grief, and sometimes we need outside supports in traversing our traumas. Especially during surrogacy, with many people involved, it’s important to understand that we all do process grief differently and needs and supports may look different for each person. Never be afraid to reach out. Egg Donor or Surrogacy - Is Travel Involved?